Watching politicians and bankers bickering over a Euro rescue on the back of Eurozone taxpayers for more or less 2 years by now, a group of Germans has staged the first protest in front of the headquarters of the European Central Bank (ECB) on Tuesday. Some 100 protesters, organized by the fringe Partei der Vernunft (Party of Reason) held up banners with two key demands: "Raus aus dem Euro" (Out of the Euro) and "Stoppt die Schuldenunion" (Stop the debt union), according to a report by German daily FAZ. 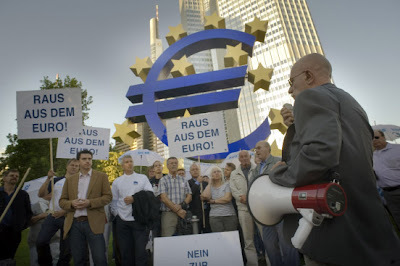 Raus aus dem Euro - Germans protest against the Euro and a European Union of debts in front of the ECB in Frankfurt. This is a historic moment as it represents the first organized democratic resistance against the common currency that has led to the UDE aka United Debts of Europe. Recent surveys show that 77% of Germans resist the creation of the European Financial Stability Fund (EFSF) and its highly undemocratic successor ESM (Euro Stability Mechanism). The German parliament will vote on the ESM on September 26 and due to heavy losses of the small liberal coalition partner in latest regional elections chancellor Angela Merkel must be less than certain to get a successful vote on an instrument that would put Germany into the top position to pay for the long profligacy of the weaker Euro members. The strategy of paying thy neighbours debt has never worked in history. The growing bifurcation of opinions among Eurozone politicians and the general populations cannot be overlooked anymore. Europeans are taxed to the hilt, suffer from economic conditions where all the freshly digitized money reaches the financial industry but never the real economy and are fed up with an increasingly undemocratic EU apparatus where the few sane voices in the European Parliament (EP) like Nigel Farage are ignored by autocratic decisions in the unelected European Commission and the EU Council. While politicians have busied themselves in the last 2 years with a string of weekly emergency meetings in 5-star locations - ironically preaching austerity - debts have seen only one way: up. We are certainly very close to a major event that will mark the beginning of the disintegration of not only the Euro, but of the EU itself. A steady stream of rumors whose reliability is difficult to estimate tells this blogger that Austria, Finland, Germany and the Netherlands have already printed local currencies and could exit the Eurozone within the remainder of September, leaving the mess created by profligate southern Eurozone members behind them. An exit of the (not so) strong aforementioned 4 countries will be complicated due to 12 years of monetary integration and would be a strong signal that European unity in debts has nowhere further to go. This possibility would be a strong setback especially to France, whose egomaniac leader Sarkozy wants to avoid descending from his status as an equal partner vis-a-vis Germany at all costs. For this reason we can rule out to find a harmonic solution of the insurmountable debt problem in all countries not only of the Eurozone, but the EU as a whole. Flirting with money from China or Russia, which surprisingly announced today it would buy the dreaded Eurozone bonds the ESM wants to issue, will not be on the cards either. China, faced with more domestic problems than one can count, and Russia are not in the position to squander their money on a bankrupt EU without risking heavy internal opposition. Both countries are far behind the (crumbling) infrastructure of the old world and have enough to do on their respective home territories. This leaves the other option of a non-voluntary Greek exit, that can be expected any day given the stress in the system and its inability to access capital markets due to prohibitively high interest rates north of the 100%-mark. As this is a first in modern history nothing can be ruled out from this moment onwards. France and Germany will then be faced with the completely different task of not only digesting billions (or trillions?) of PIIGS debt that will have to be written off to a very large degree, but also the challenge of holding together a European Union whose only common denominator are debts on all levels, public and private. I have intentionally avoided any figures in this post as we are now in the third year of bad 'surprises' by cheating Eurozone members. The volume of this mess will only be discovered in national bankruptcy proceedings and bank liquidations. Finding a lot of bank analyst 'research' in my inbox that suddenly mention the coming end of the Euro in its current form, I do not deviate from my earlier forecast Euro Until the Endsieg. The end of the Euro was also correctly predicted 11 months ago in this blog: 20.10.2010 - The Day the Euro Started Dying. Readers are also probably better off in the medium and long term by abandoning the illusion that the Swiss Franc is a safe haven. The Swiss economy depends very heavily on its financial sector that contributes at least 12% to domestic GDP. A world of several 100 million investors cannot find a safe haven in the currency of a 7 million people. As the old adage goes, "one can hedge 100 million but not one trillion", the Swiss franc cannot shoulder the mistakes of the rest of the world. 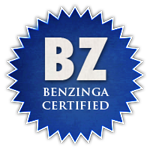 All dissolutions of monetary systems ended in economic hardship, wars and revolutions. This time will be no different.